We were leaving beach scenes like this behind. Heading for the Dolomites of northeastern Italy almost has become an annual ritual for us and being in those mountains is certainly one of our favorite events. Weather usually dictates that our approach will be from the south as we begin our riding season in the relatively warmer and drier southern reaches of Europe and aim to be at the higher elevations as the snow clears from the passes. As too often happens, 2009 was a wild weather year and late and heavy snows foiled some of Bill's routes in the western Alps as we waited to head east to the Dolomites. Late snows in the passes were a general problem; heavy rains became another, more immediate issue. First it was the forecast of 5 of 5 days of thunderstorms while at sea level Genoa on the Mediterranean. We cringed at the evening news report as we organized ourselves for our next foray into the mountains. Then it got worse: before we left the hotel room the next morning the TV news was reporting serious flooding in eastern Czech Republic. We came within hours of being stranded by serious flooding in the western part of the Czech Republic in 2002 and had no need for the 2009 reporter's video to know what it looked like. 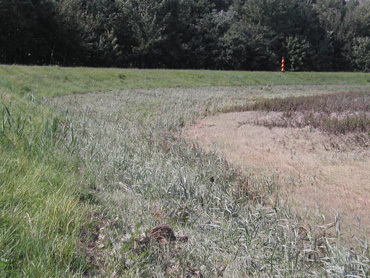 High water lines in the grass along the bike path in 2002. The current eastern Czech floods were far north and east from where we'd be but experience had taught us of the wide reaching impact of such floods. In 2002 Bill had carefully compared the TV reports of flooding with his maps revealing catchment basins to select a valley that should be shielded from the high water. A few days later when we arrived by train in our strategically selected oasis from the chaos, the bike lanes were just drying out from local floods that had been intentionally caused by diverting water from the devastating flood zones. So much for planning! When our local thunderstorm laced with large hail stones hit during our first evening out of Genoa, we learned via TV that the flooding now extended far west into Austria and Switzerland. The problem areas were still well-north, but now included due-north instead of only far-east and north. People were isolated; tourists were being rescued by helicopter; and almost a dozen had lost their lives in the high waters. The flooding region was safely away from our destination for our 3+ weeks of hiking but eventually we would be exiting the mountains through the regions of Austria currently affected by the floods. In the days ahead as we rode north away from the coastline and along the Adige River towards Trento and beyond, we studied the swiftly flowing waters. Judging by the amount of submerged bank-side foliage and trees, it appeared that the water level was at high-normal. Given it was late June, melting snow pack rather than flooding seemed a plausible and reassuring explanation. Regardless of the languages available, if our room for the night had a TV during this interval, we tried to sort-out the broader weather situation as we headed deeper into the potentially more dangerous mountain region. Our forecasted daily thunderstorms were dropping little water on us and luckily what did come down was after we were indoors for the night. The "blue things," as we usually refer to the areas indicated on the TV 'precipcasts' as rain, continued to hang over the Dolomite region of the Alps, much of the Balkan Peninsula, and farther north. We somehow never organized ourselves to check online reports to assess if it was snowing in the Dolomites. We've been snowed upon several times when there in the summer and instead of checking the facts we reminded ourselves that we'd have a good stay regardless of the weather. And after all, it was already too hot to be anywhere other than in the mountains. At least we went downhill on this one. It amazes me that we have to delay our early summer approach to the Dolomites because of snow in the mountains and yet every year we seem to struggle in the heat as we claw our way out of the low lands up into the mountains. It seems that there is the smallest of gap between deep snow pack on the ground and oppressive heat in the air. Despite the current flooding to the north of us, this year's journey in late June was true to our experience and our mid-day temperatures were consistently in the 80°'s and occasionally bumped up to about 90°. Without giving it a second thought one afternoon, I spontaneously announced that I thought excessive heat added the equivalent of about 3% of grade to a slope. Bill's "How steep is it?" aided in my snap judgment as it is typically a 6% grade that prompts his question. I didn't have to look at my handlebar-mounted 'inclinometer' when he asked because I'd been constantly studying it in disbelief: its consistent 3% reading was well below my sense of effort--by about 3%. We stopped often on these hot afternoons. Each day's mileage wasn't so great but the level of effort was always high because of the combination of the increasing grades and the heat. On this particular day I heard my legs saying "Couldn't we not do it and say we did?" as we turned from the river route into the hills. Apparently our string of relative-rest riding days near the sea had been too restful and despite encountering brief bits of 10%+ grades, our legs had lost their climbing form for back-to-back hard climbs. Usually once conditioned they shift into a trance state when we hit the steady climbs and silently do what needs to be done, even if it takes hours. But not this day nor the next several as on these pre-Alps days they tried hard to negotiate and whine their way out of the task at hand. This, not cyclotouring, was the sea level sport. One of the thrills of leaving the beautiful Mediterranean seashore and heading towards the mountains is always the shift from feeling like we are the oddballs, the strange ones, to feeling that we are on the winning team, that at last being cyclotourists is appropriate. The sense of being in our element snapped into place with our arrival at Lake Garda in the Lake District of northern Italy. The 34 mile long Lake itself is only a little over 200' above sea level but it is where the sporting culture begins to take hold in earnest. Our host at nearby Rovereto got dreamy-eyed and spoke in German of "being in nature" when at the Lake. Startled by his comment, we realized that we could only go as far as describing it as "being outdoors" rather than "in nature." But regardless, it was indeed a wildly popular outdoor recreational area and we finally fit-in. Mother Nature was tamed long ago in The Lake District as the area has a history of genteel summer holidays mostly spent on the lawns of grand hotels and leisurely floating on the Lake in steamers and other large craft. There is little apparent "roughing it" even in the cramped campgrounds--its tradition is one of enjoying the outdoors in a civilized way. 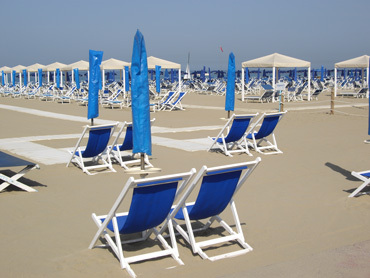 The relatively elegant outdoor experience looks to us like an extension of the beach culture along the Mediterranean at the Italian Riviera not so many miles south. 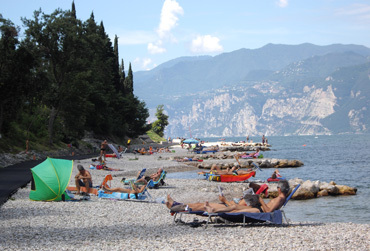 Sunbathing on Lake Garda's constructed gravel beaches. But RV's with German, Swiss, Netherlands, and Italian plates plied the narrow roads even before high season hit; people flocked to the manufactured rocky prominences to sunbathe; windsurfers gathered at the windiest pockets of the lakes; and cyclists of all varieties competed with bigger wheels for a place on the sinuous road around the Lake. It's that festive holiday energy that I love when we are in places where people are determined to have a good time. It was amazing to suddenly experience the sporting buzz along this skinny lake that varies from being as little as 2 miles wide to as much as 11 miles. 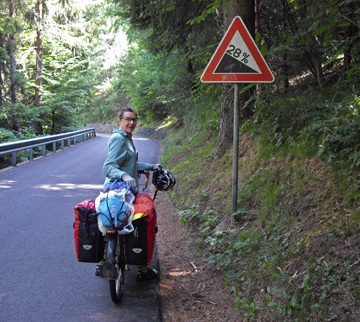 It was when we approached the crest of a low pass between Lake Garda and the city of Trento that we joined our first formal bike path of the pre-mountain region. We weren't yet in the mountains, but these river valley paths were markers for the network of paths that approach the mountains. Now almost all of the cyclists would be in bright, fresh Lycra garb instead of the more familiar urban dwellers on the bread-run; being early in the season, many of the folks were sporting brand new bikes and bags. It was a dizzying array of riders on the orchard paths. School was just out and so there were more families on wheels than we usually encounter. Seeing a half-dozen or more riders with identical, non-waterproof panniers often indicated a supported group tour of several days or a week's duration. And we'd listen for the language spoken as groups of tanned, late-middle-aged men went whirring by--more often than not it was German. Grabbing the beers from the bus pulling a bike trailer. Once in Trento itself, a bustling junction city of over 100,000 people, I spotted a common summer sight, which was a full-sized, high-end touring bus towing a covered trailer for bikes. The driver's assistant was pulling out a case of assorted brands of beer in glass bottles from an outside storage compartment--no doubt to have ready for the cyclists they'd soon be picking up and transporting to their hotel for the night. I loved seeing the tempo built for the cycling frenzy though we'd break-away from these tranquil river routes before lunch the next day. Then I'd have to content myself with the lingering mental images of the fun. It was in Trento that we wrapped-up the familiar process of slowly collecting the items that would be unavailable or over-priced in the hinterland. I'd picked up an extra tube of sunscreen in France where it was over $4 cheaper; Bill again unsuccessfully tried to buy GPS hiking maps each day; and we strategized as to which town would be the last in which we could buy a budget-priced cooking pot to supplement our equipped apartment kitchen. In a few more days we'd burden ourselves with as much red pesto sauce and favorite chocolate bars as we thought we'd be able to haul up the steep grades into our high-mountain valley resort village. As we left Trento, we climbed up into the foothills of the Alps where we'd primarily be in the company of the bronzed and ultra-lean men on super-light, swift riding machines that were deeply focused on completing their intense training rides. Gone would be the laugher, the smiles, and the sometimes apprehensive expressions on the more gently-graded, off-street, dedicated bike paths along the river. Once again we'd feel the isolation of being around only a few riders and all would have their game faces on. Extending our lunch/cool-down with an Italian children's book. Our riding day that ended in Cembra at about 2,200' had been hot and sweaty. We stopped often in the shade to drop our body temperatures and to let our comfort level increase as our soggy clothes dried a bit in the hot, intermittent breezes. At lunch we ripped off our socks and cycling sandals to accelerate the cooling we longed for. We were experiencing the intense sun exposure that darkened those lean riders but we had no interest in working on a tan. Despite being hot during the day, our ride up the Val di Cembra to the village of Cembra represented crossing yet another transition line--this time we thought of it as the laundry line. The night before had been like a string of others: the late afternoon was so hot and windy that hand washed clothes that hadn't been wrung in a towel would still dry in a couple of hours. In Cembra, our laundry was damp when we went to bed. We'd hit a markedly different climate zone even though the weather pattern was unchanged. But then the weather did change. As had happened in previous years, exiting the areas at Cembra's elevation brought a change in the weather as there seems to be an invisible weather line as we approach the mountains. Below that line our memories were filled with how hot we had been and where we had found the best spots to cool down. Above that invisible elevation line, our memories were more often of where we sheltered from the rain or where we had gotten soaked or muddy. This year was typical of past years: we struggled against the unseen pressures of climbing in the heat in the morning as we left Cembra and shortly after lunch there was a chill in the air...and then later it poured. In another day or 2 we'd be in the mountains, we'd be in the Dolomites, and the many cyclists would once again be diluted by other outdoor enthusiasts as was the case around Lake Garda. This time it would be hikers and white-water seekers entering the mix in ratios that varied with the particular village rather than sunbathers and wind surfers on the Lake. The proportions of athletes that qualified as 'dabblers or driven' would fluctuate as the opportunities and support services came and went for both land and water sports. An onion-topped steeple in the vineyard region. There were many other transitions to watch as we gained elevation while making our way from the Italian Riviera along the Med to Lake Garda in the Lake District to the more vaguely defined 'intermountain region" to the Dolomites. The distinctive "old world charm" architecture of the genteel side of the Lake District would slowly give-way to stained wood trim on mountain chalets as we rode higher. Even the architecture of the churches would change. In the lower lands boxy or squared steeples were dominant but as we approached the mountains, onion-topped shapes became more prevalent. The vegetation would shift too as we rode north. The river routes on either side of Trento often meandered through agricultural land with apples being the mainstay of the local industry. As we rode higher and especially when we left the riverbanks and dikes, vineyards became king in this 'intermountain region'. The ever-visible vineyards and quarries around Cembra that revealed the heart of the local economy would suddenly give way to forests and hay fields that were the primary fruits of the higher lands. Deeper still into the mountains, large and small ski lifts would begin cutting swathes through the timbered slopes revealing yet another localized industry. 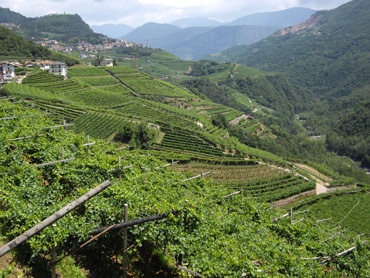 Looking north to the mountains from the Val di Cembra vineyards. The scents accompanying the vegetation changed too as we gained elevation. In the lower lands around the Lakes our noses lingered with each whiff of jasmine or honeysuckle. Once we started riding in the orchards, it was the unwelcome smell of agricultural chemicals that prevailed and became almost overwhelming when we progressed to the level of the vineyards. We reassured ourselves that at least we could measure our exposure to these toxins in terms of hours, unlike the area residents that measured their exposure in terms of weeks or months each year. As we entered the mountains, the rain-freshened air had the more neutral aroma of distant damp grasses and hay. Our vantage point would change also as we progressed higher. As we rode through the low elevation orchards, we looked far away and up at the distant mountains. As we climbed towards Cembra in the almost-mountains, the road rose hundreds of feet above the river and our gaze was often across the deep gorge and down. When we arrived in the mountains at Moena, we'd again be at river level and our gaze would be forced up and held by the dramatic peaks that occasionally surrounded us. Italian started being nudged aside by German as soon as we arrived in the Lake District. I knew that in some areas of the mountains that German, not Italian, was the preferred language but had to wonder if in the Lake District the use of German was instead a courtesy--OK, marketing--to the many German-speaking tourists. Regardless of the cause, with each passing day, we were hearing and seeing more German. And then it stopped. 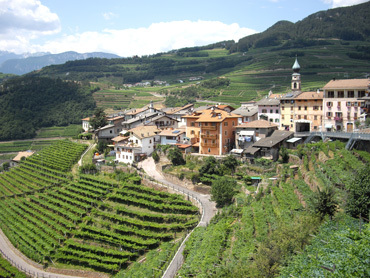 At Cembra, the land of vines and porphyry stone quarries, Italian was the spoken and written language and German was only offered in response to our clumsy Italian. As in the Dolomites, our imperfectly spoken Italian triggered the assumption that we were native German speakers and we would be addressed with German even if we persisted in speaking Italian. 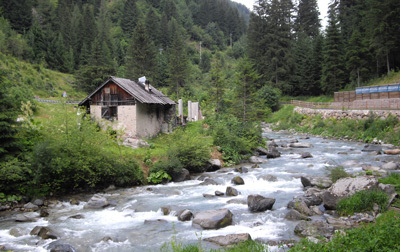 But once nestled in the mountains, German would become the spoken language of many of the locals. Along with language shifts, arriving in the Lake District had also triggered the shift in food related matters. The Italian breakfast tables started being set with the Germanic "abfall" buckets--little containers scripted to indicate that you could keep your table tidy by depositing teabags and yogurt container tops in the mini-bins. And each day Bill held his breath to see if the requisite breakfast that came with most hotel rooms would shift from the Italian mainstay of cappuccino's and croissants to hearty fare fit for a Black Forest lumberjack. Disappointingly the abfall buckets appeared long before the substantiveness of the breakfast buffet changed. The vineyards & quarries gave way to timber & hay. Muesli cereal that was absent from supermarket shelves south of the Lake District became increasingly available and varied as we made our way north and then it too disappeared until in the mountains. It would take actually being in the heart of the mountains before the breads came close to being a meal in themselves as is often is the case in Germany. "It's the same country but different people" popped out of Bill's mouth as we discussed the transitions we were seeing. There was a different ethic, a different attitude, and likely a different world view in the northern reaches of Italy. We knew it wasn't our imagination as the differences are formally recognized by several of these northern provinces being legally designated as "autonomous regions"--regions with special privileges because they are different than the rest. Though we weren't yet in an autonomous region, we could feel that this was yet another approaching transition. We'd last been on the road to Cembra in 2006 and we were stunned at the economic development that had occurred in the area since then. "From scratch" commercial villages of a half dozen to a dozen buildings had been built along the road; I readily spotted at least a half dozen grocery stores over the course of a day's ride where it had previously been difficult for us to buy food; a 'tour the vineyards' wine route was posted on our formerly humble road; fresh asphalt was under our wheels; and sturdy new roadside barriers gleamed in the sun. With this influx of light industry and commerce I noticed the presence of 30-something women wearing Islamic head scarves in several of the villages where I hadn't noticed them in 2006. I wondered what the story was behind this mini-migration and how it was going both for them and their new communities. We wondered too if the crucifix that we found in the drawer instead of hanging over the hotel bed where it clearly once had been was coincidence or not. These, like so many of our questions, remain unanswered. 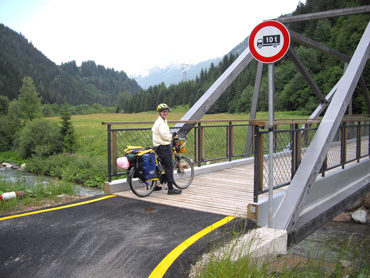 Too cool, the 20+ mile long bike route through Val di Fiemma was finished--or close enough--in 2009. Every year that we traverse this valley we hope and hope some more that the bike route with such fabulous potential will have been completed. The main road is OK but it is only 2 lanes and has fast traffic intermixed with big trucks. Cycling on the road demands too much of our attention as we would rather be savoring the scenery than focusing on staying alive. A new bridge on the newly finished bike route. This year as we discovered newly completed segments--some in which the asphalt almost was steaming it was so fresh--we reminisced about our past struggles in those areas. "It was here," "Oh, there's the place," "That's it, that's it" were sprinkled in our running commentary as we remembered failed attempts to make the route more complete than it actually was. In prior years, we so desperately wanted to luxuriate on our own carless path that we'd press on past "Closed for construction" signs or ambiguous junctions hoping to connect the dots ourselves. We knew the route was being build in segments, not from one end to the other, so there was always hope of making an 'almost ready' link work. But the mud in the past was memorable as we slogged through questionable areas only to be forced to retraced our tracks and take to the busy road. In previous attempted crossings, the in-progress bike path sometimes abruptly stopped or the transition to gravel and mud became impassable. Or perhaps the new bridge for bikes wasn't there at all. Each year there was more available route, each year we pressed to the newest edges of the construction work. The sound of rushing water instead of trucks on the bike route. This year the long-awaited link to Moena was just barely done with one mid-route access bridge still under construction. We sailed along grinning as the noisy river nicely separated us from the road peppered with heavy trucks. This year the abrupt line between the fresh asphalt and rock underlayment occurred at the edge of Moena. So close, and yet not quite done but for us it didn't matter. At least this time they'd left us an easy escape onto the now-adjacent main road. There was no back-tracking penalty this year for having pressed on. No doubt it will be linked up with the village next year should we come this way again. This year Moena, at about 3,800,' was our first overnight stop in "the mountains." We had arrived. The high peaks greeted us between rain showers as we rode the last mile into the village center after stopping at our favorite supermarket at the edge of town. Hotel Post--there must be a Hotel Post in almost every alpine village whether in Switzerland, Austria, and Italy--would again be our host for the night. Our Hotel Post in Moena was decked out in flowers. Here in the mountains the iconic local artisan woodwork and furnishing defined the decorating theme. Often the simple wooden chairs with fabric seat covers would have a heart-shaped cut-out in the back though this Hotel Post's were of a more indifferent style. Ours would be honey-toned paneling and furniture this night, other nights in the mountain villages the woodwork would be in rustic dark tones. Small windows set in thick walls added to the cozy feeling and reminded us that cold weather and snow, not the short warm summer, shaped the architectural preferences. And a pleasant practicality would now prevail: instead of signs posted in the room prohibiting clothes washing in the sink, a clothes line with pins was pre-strung on our private balcony. Wall to wall carpeting becomes the standard in the mountains, replacing the cool, clattery floor tiles preferred in the lower, warmer elevations. Lower ceilings, warmer colors, and the softer surfaces of the mountain residences all collude to send the message that "You are in a different place--you are in the mountains." Moena, like other villages we bypassed on the bike route that afternoon, was decked out in the irrepressible 'mountain cute.' Trailing flowers poured out of balcony boxes and baskets whether the building was in a sorry state or was painted with regional scenes on the exterior. Quaint street lamps and street corners were made cheery with more brilliant flowers. These mountain villages, as was the case in Moena, often have a river running through town that formerly operated various mills and they were now focal points of the urban scene with shade trees, benches, and more flowers. The heart of Moena's retail district. 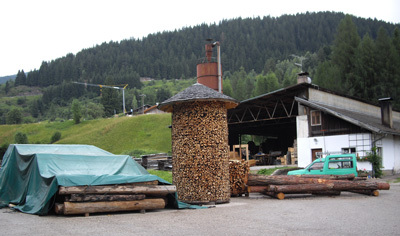 Portions of roughly hewn logs become popular for street-level flower boxes, park benches, and to camouflage public water spouts in the villages. The requisite window shutters were often 2-toned instead of the ubiquitous 'lawn-chair green' as in much of Italy. White trim on red; brown trim on mustard; dark green on white or light green--the shutter color combinations were highly varied and further set each distinctively painted building apart in Moena's tiny core. The dangling icicle lights trimming the eves of some buildings that must be enchanting against snow covered roofs added to Moena's summer-time pizzazz. One of the joys of being in these mountains is the "up-energy", the festive, unremittingly cheery affect of the buildings and the streets. Just like the right music or right company can elevate a dreary mind, being in the presence of colorful, well-tended village streets can tip an ambivalent mood into a better place. Though spending the night in Moena signaled our official arrival in the Dolomites, it would be a couple more days before we planted ourselves in Selva di Val Gardena for our 2 week stay. The elevation gains were tough any way we went from Moena and Bill routed us onto a more circuitous and more up-and-down course for the purpose of reconnaissance work. Recon work in the Rosengarten area of the Dolomites. 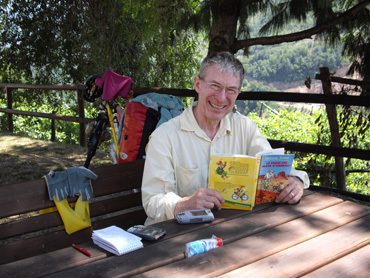 Bill is always on the look-out for new Via-Ferrata climbing routes that are within our ability and he knew that there were several in the area of the stunning Rosengarten peaks. Information about lodging, services, and the routes were hard to come-by so going there ourselves was the latest plan to nail down the details. We huffed and puffed our way up to be in the majesty of those mountains and discovered that indeed the tourist resources were slim. It was unfortunately one of those areas that almost require a car to access. We studied the roadside bus schedule and determined that we could hike in the area by staying at the first village well down the mountain and taking the bus back up to the cable car each day for hiking. It would require careful planning as there were 3 buses up in the morning, 2 down to the village in the afternoon, and limited food and lodging. But Map Man had what he needed to fold Rosengarten into his itinerary options, either for later this summer or for another year. This ride to Rosegarten was the first day we got nailed by the daily thunderstorms. It was too warm to willingly put on our rain gear for the remainder of the climb and so for a second time that day we sheltered under the thin canopy of some trees. We quickly ate our lunch in the drizzle and waited. Better than an umbrella for sitting out the storm. A small car pulled into our rare turn-out and stopped to let a pre-teen boy out to pee in the bushes. The rain picked up and poppa restarted the engine and alarmed us by backing towards us. He quickly hopped out, popped up the hatchback on their tiny car, and invited us in German to stand under the hatch instead of my tiny umbrella. But no, we weren't invited to stand but instead to sit in the back storage area of their vehicle. Luckily they were on a day trip from their campground and the luggage area was empty. 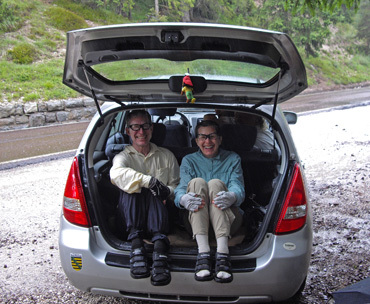 The warm air of their car interior dried our damp clothes despite the hatch still being open and momma, who was in the backseat with the other child, chattered away with Bill in German. Bill struggled to flip his second language setting from "Italian" to "German" and kept up as best he could. "No, they weren't in a hurry" she said as they must have lingered for a half hour for us until the rain lightened up. The shelter from the rain; the rest from the steep climbs; and the "gemutlichkeit" or 'good times' from this cheery family buoyed our energy for the rest of the day. 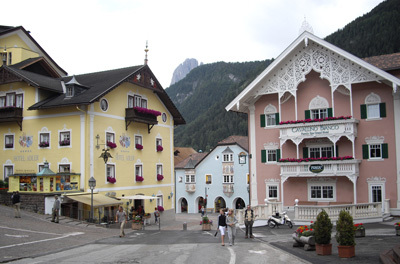 Downtown Ortisei oozes with mountain cute. 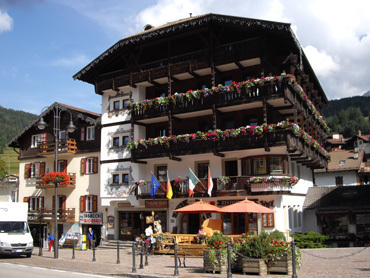 After that ridiculously short ride between Ortisei and Selva in Val Gardena, we finally arrived at our upper Selva apartment as scheduled around noon on the 4th of July. 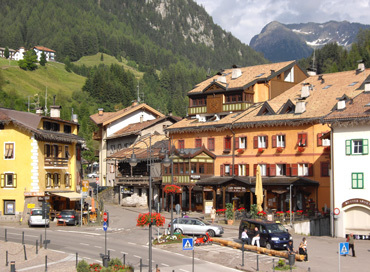 We'd spent the night in Ortisei, a mere 6 miles away from Selva, as in previous years and will likely do so again. As always, it was an exhausting effort to accumulate over 1,115' gain in those 6 miles--an interval that required about 2 hours of elapsed time because of the many rest stops demanded by the steep grades and warm weather. One short stretch on to a multi-use path at about mid-way in St Christina was a '2-to-a-bike' push as the road there was so steep and narrow. This ride is always made more difficult because we load our already heavy bikes in Ortisei with as much food as we think we can drag up the grades--this year it amounted to about 40 pounds in extra weight. The discount EuroSpin market has basic food items at prices that are sometimes 25-30% of what we'd pay in Selva. We'd make 1 trip back to the EuroSpin to resupply in a week but I gave us a buffer by buying 9 days worth of tuna, beans, polenta, pesto sauce, and chocolate bars. A bottle of olive oil, enough pasta for 6 dinners, a bag of nuts for hiking food, and some miscellaneous items would add to the savings that would approach being equivalent to a night's stay. Wistfully, we had to draw the line at buying bulky and heavy things like toilet paper and laundry detergent and we'd pay resort village prices for them once in Selva. 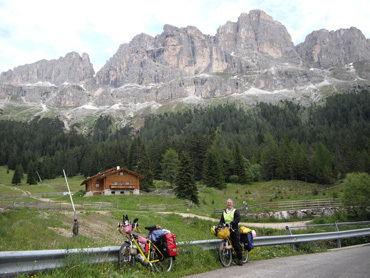 Having gone from sea level on the Mediterranean at Genoa to about the 5,000' level in Selva di Val Gardena, we'd completed our "Sea to Mountains" transition for 2009. Now we were firmly anchored in the mountains, away from the potentially searing heat of the lowlands and even in the "pre-Alps valleys." Now we'd use our base at about the 5,000' level to double our elevation some days, either getting to the 10,000' level on our own or with a boost from a cable car. After our 2 week stay in Selva, we'd move from village to village to elude the advance of high season prices and to vary our hiking options. As in the last couple of years, we'd likely spend a month or more hiking and biking in the mountains before venturing back into the lowlands. We've just left the Italian Dolomites and are now a bit west of them in the Italian part of the south Tyrolean Alps. Literally only a few miles away from the Dolomites both the look of the mountains and the feel of the culture have changed dramatically. Unfortunately, those pesky thunderstorms haven't changed and the raingear is staying handy in our panniers. We are a few miles away from the Brenner Pass and Bill is threading us through the mountains on quieter roads to land us in Austria for a bit more hiking. We've lightened our loads by sending home our Via Ferrata hiking equipment and some other seasonal items, so our hikes won't be as "airy" as is the euphemism for some of the Via Ferrata routes. After hiking in Austria, there is about a 4-month gap in Bill's route plans. We are still planning on finishing our touring year in Portugal in December and given that Lufthansa has dropped our Frankfurt-Portland flight, even our departure city is unknown to us.